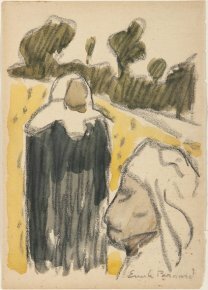 26/03/12 - Acquisition - Quimper, Musée des Beaux-Arts - The Musée de Quimper recently acquired an unpublished drawing by Emile Bernard, entitled Harvest (ill.) from the Doyen gallery in Vannes. Two stately women stand out against a landscape made up of a yellow field and a green wood ; the head of one of the figures appears in profile in the foreground, while the other is standing face on further back. The artist sketched them in with a few strokes without detailing the features on the faces, more interested in outlining the forms and planes. André Cariou, chief curator at the museum, points out that this drawing illustrates perfectly Bernard’s method of working : the composition is defined by charcoal strokes, certain motifs such as the cap worn by the women and the sky are left "in reserve", the rest is filled in with color blocks. The work dates from the period when the artist started the Synthétique movement with Gauguin in Pont-Aven. Influenced by the primitives and Japanese engravings, both created compositions with simplifiied forms, made up of pure colors and enclosed areas, in which traditional perspective and volume effects are ignored. The position of the figures is also interesting as it communicates the desire to break through the boundaries of the frame. The harvest theme recurs frequently in Emile Bernard’s work ; two paintings at the Musée d’Orsay represent Harvest on the Seashore (1891) and, above all, closer to the Quimper drawing, Harvest (1888). The same subject can be found in Van Gogh whom the artist met in 1886-1887, as well as in Gauguin whose Yellow Haystacks are well-known. The scene evokes the rustic Brittany which fascinated Bernard, Gauguin and so many others, in search of authenticity, even exoticism, in short "an unpolished humanity" ["d’une humanité fruste"] as Gustave Geffroy wrote in describing another Bernard canvas exhibited at the Salon des Indépendants in 1892. Emile Bernard would repeat the motifs in this drawing for engravings shown at the exhibition of the Pont-Aven group in Paris at the café Volpini in 1889. The woman standing is seen in Briton Women Harvesting, while the head of the second figure is visible in The Wedding in Brittany . This drawing will enrich the museum collections where the artist’s works are in fact not that extensive. Besides two painted studies from 1885, a painting from 1886 entitled August, Orchard in Pont-Aven evokes the Pointillist period of Bernard’s early career ; the years 1888-1892 are recalled in a watercolor, The Wood at Amour and six engravings (deposited by the Musée d’Orsay). A beautiful Self Portrait with Yellow Turban from 1894 signals the start of the Egyptian period but is still in the Pont Aven style while, as André Cariou notes, the Study of Briton Women might not date from 1888 but rather the early 20th century, repeating later on a style which first celebrated the artist’s talent. Two engravings reproduced by Daniel Morane in Emile Bernard, Catalogue de l’oeuvre gravé, Musée de Pont Aven, 2000.